I was born in Chelmsford where much of my schooling took place. By profession I was a Chartered Surveyor but since retiring am able to spend more time drawing & painting than hitherto. I have been painting in watercolour and exhibiting for the last 48 years. Most of my inspiration has been gathered from travelling throughout Great Britain and France. Subjects are often landscape, architectural & topographical subjects with details creeping in from time to time. Pictures mostly reflect the atmosphere of place & are often culled from some 100 sketchbooks accumulated over the last 45 years. Although I have lived and worked in Bedfordshire, Surrey & Kent I am currently living in Lincolnshire where The Wolds & the undulating Lincolnshire countryside is inspiring watercolours that can be seen in the GALLERY. I tend to use a somewhat restricted colour palette & work predominantly on rough watercolour paper. I am often more interested in the atmosphere of a place than the precise detail & particularly enjoy laying dark toned washes. Nowadays I find great satisfaction in mixing colours that don't just relate to the desired colour but also accommodate the technical properties of the selected pigments. 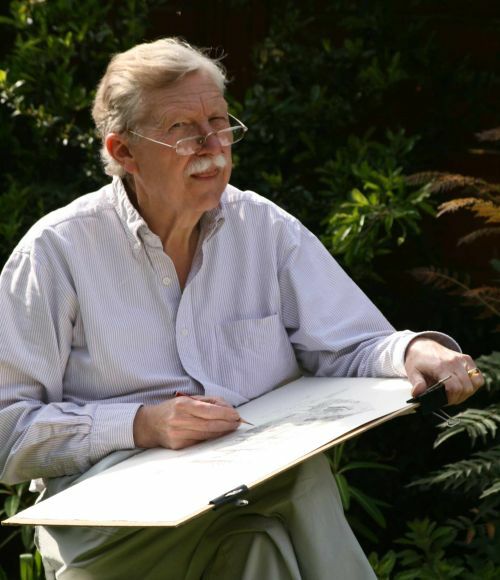 Without doubt the greatest influence and encouragement came from my one-time tutor John Blockley RI whose untimely death I continue to lament. I am married to Margaret & we have a married daughter, Sarah, who trained as a graphic designer and now lives in the Fens. Margaret and I are committed Christians and members of All Saints Church, Wragby where we regularly worship.